For years, officials in charge of Chicago area waterways have heard that urgent demand from federal and state authorities, the courts, environmentalists and this editorial page. Major case in point: The Chicago River. A world-class city cannot allow the river that runs through it to be polluted with bacteria-laden sewage and trash. Not if it wants visitors to stroll the riverwalk. Not if it wants to create business opportunities and burnish the charm of Chicago as a tourist-friendly city. Over the years, the commissioners who run the Metropolitan Water Reclamation District of Greater Chicago have made strides, often under regulatory or court pressure, to clean up the Chicago River and other area waterways. Wednesday is a significant day in this vital effort. That’s when the district launches a new $31 million facility built by Vancouver, Canada-based Ostara Nutrient Recovery Technologies. The aim: To scrub and recycle phosphorus from billions of gallons of wastewater that flows through the Stickney Water Reclamation Plant in Cicero. Here’s how it will work: Concentrated pollutants from treated water will be diverted into 43-foot-high stainless steel vats, called reactors, where phosphorus is recovered through a chemical process that adds magnesium to the water, extracting the phosphorus and nitrogen. That phosphorus and nitrogen then grow into small granules or pearl-like “prills,” ready to be sold as an environmentally friendly commercial fertilizer component. The district estimates it can produce up to 10,000 tons of the crystals a year, priced at an expected $400 a ton. If all goes well, the district should clear about $2 million a year after costs, MWRD executive director David St. Pierre tells us. Why all this effort to scrub out phosphorus? Because too much of it from agricultural runoff, fertilizers in lawns and golf courses and discharge from water treatment plants plays havoc with lakes, rivers and other waterways. In the Gulf of Mexico, there’s a phosphorus-fueled dead zone of thousands of square miles, for instance, where algae bloom but fish, turtles, dolphins, birds and other sea life struggle. Polluted waterways also scare away boaters and other recreational users. Much of the phosphorus that eventually reaches the Gulf of Mexico comes from agricultural runoff. But Chicago and other metropolitan areas contribute as well. The Stickney plant, for instance, discharges into the Sanitary and Ship Canal, which flows into the Des Plaines River, and eventually reaches the Mississippi River and the Gulf of Mexico. Chicago water district officials “are taking a big leap … that everyone in the world will pay attention to,” Ostara co-founder and CEO Phillip Abrary tells us. Is that leap big enough? Environmentalists have long argued that the district and state should set more stringent limits on phosphorus discharges, as other municipalities and states do. Smart. If the Stickney plant performs as expected, the district could — and should — build other plants to spread the cleaning and recycling across the region. Chicago should lead the world in innovative ways to clean its waterways. The new plant is a strong start, not cause for a victory celebration. 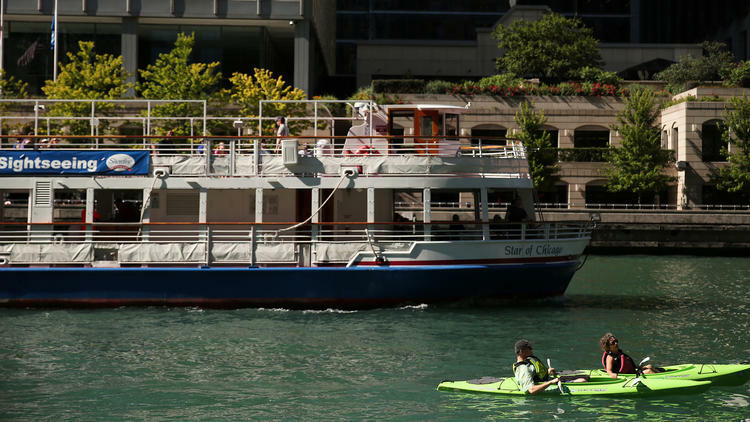 The Chicago River and other waterways are cleaner, but not clean enough. Keep going, commissioners.